Kiwi Pundit: Can Ethnic Communities Trust Mayor Len Brown now? Can Ethnic communities afford to have confidence in Mayor Len Brown? Do you need a caption of the most-talked about couple in Auckland over the last week? Do you plan to reappoint Chuang to the ethnic people's advisory panel (EPAP)? One may ask Len Brown: What is his rationale of NOT appointing Bevan Chuang to EPAP? Would not the same answer be true why he is equally unsuitable to lead us as Mayor? 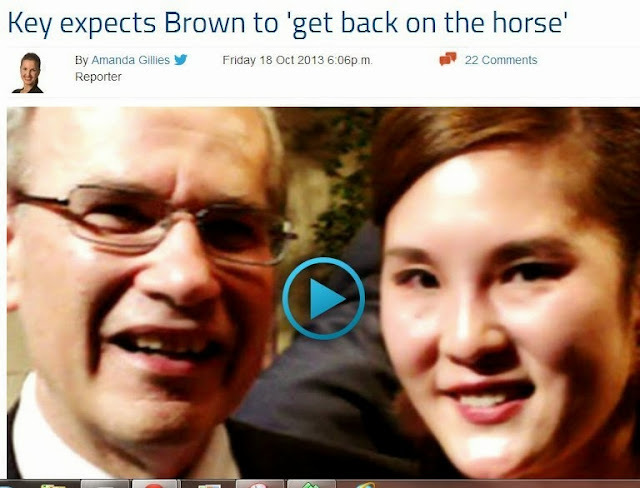 It is a foregone conclusion in what esteem Len Brown holds an ethnic woman he had an affair with. Racist and derogatory names such as Yellow Fever, China Girl, Geisha Girl, Manchu Girl, Peking Duck and Asian Lolitas reveal more of Len’s character than that of Bevan. Is this also the tone and manner in which Len treats Ethnic Peoples Advisory Panel (EPAP), the survival and longevity of which is solely at discretion and whims of the Mayor? Adultery is not a laughing matter. You cannot continue to treat ethnic communities in such contempt. The question that ethnic communities need to ask is: Can this Mayor, who treats at least one member of an ethnic community and a Board member of EPAP in such contempt, be trusted with his rhetoric about multi-culturalism, and Auckland being the most liveable city with this rainbow of colours? He is in the habit of talking passionately and flamboyantly about ethnic make-up of the city in any ethnic gathering, be it EthnicA conference, EPAP do, or any ethnic celebration. Do we not now hear a resounding echo of hollowness and hypocrisy in such claims? EPAP has no legal base. This reflects the low-regard with which ethnic communities are treated by the Super City. It appears EPAP has been degenerated as a plaything of Mayor, who has the sole discretion of appointing it, if at all. Ethnic communities have already expressed their dissatisfaction with this autonomous power of the Mayor. The racially degrading, and contemptuous de-facto treatment and name-calling that Bevan got after the affair may have been deserved, as some may judge. However, it is also a wider manifestation of how ethnic communities may have been treated by the Mayor and Council. Camille Nakhid, Chair of Peoples Ethnic Advisory Panel (EPAP), a mere ceremonial body and cheerleaders of Auckland Council and Mayor Len Brown. She questions lack of colour in Auckland Council. “…we see that there are very few, if any, ethnic staff in management positions in Council or on any of the Auckland committees. Where you can find us is in the voluntary sector. All the well paid positions are held by those that are not from ethnic backgrounds. What does that tell us, not only about Auckland, but of Auckland Council? She queried who sat on the appointment panels for council staff positions and short of accused the mayor of using EPAP as a window-dressing and cheerleaders of the Council. “What representation and opportunities in decision-making do ethnic people have in Auckland Council? Is it really for us migrants with many faces, many diverse voices but with no decision-making powers? Does this ceremonial body Ethnic Peoples Advisory Panel (EPAP) have any teeth, expectation of longevity or being entrenched into law? Or is it just a window dressing? However, my question is - I wonder what diversity does Auckland Council’s Media and Communication Department reflect when it has to communicate with fast browning people who would soon reflect some half of Auckland Super City population? The answer my friend, is blown with the wind, the answer is blown with the wind. This is because, the Mayor who promises to look into such grievances only in ethnic meetings, appear to have little time for such issues. Perhaps now we know why he has no time to look at real ethnic issues. While Labour List MP, Rajen Prasad, who was present promised to put a private bill to legalise EPAP, that still remains a dream. From Left:Mayor Len Brown, Labour List MP Rajen Prasad and Deputy Mayor Penny Hulse. Prasad promised to introduce a members Bill to give legal teeth and position to EPAP. The question that goes begging is: With so much discretion over ethnic issues, and having just coming scathed with an affair with an ethnic woman and his derogatory remarks, can ethnic communities now have confidence in Mayor Brown to be impartial in his decisions relating to ethnic communities? The answer my friend may be smeared on the Mayoral Couch or on a table in Ngati Whatua room. Do we have a case of a White Auckland Council, a brown Super City population?